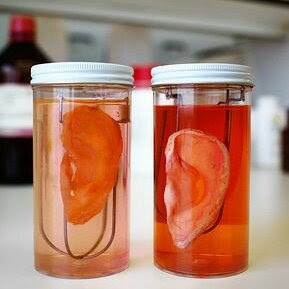 A group of scientists in London's Royal Free Hospital and Madrid's Gregorio Marañón hospital have been able to grow body organs such as the nose, larynx, ears and parts of the human heart in the laboratory using cells from a person's cells. This technique seeks to do away with the need of transplanting human organs from other people, thereby reducing the likelihood of organ rejection and long waiting periods for suitable donors. The scientists have been able successfully replace a man's windpipe (membranous tube with cartilaginous rings that conveys inhaled air from the larynx to the bronchi), arteries. It is hoped that with time they would be able to successfully grow and replace human hearts, liver, kidneys and other organs in the human body. If you are interested in reading more about this and seeing interactive photos that details the process involved please click in the Source link below.